A number of prints may be obtained successively from a single specimen gathered at its fruitful prime. To those of my readers interested in the science of this spore-shower I give illustrations of examples of the two more common groups of mushrooms - the Agaric, or gilled mushroom, and the Polyporus, or tube-bearing mushroom. 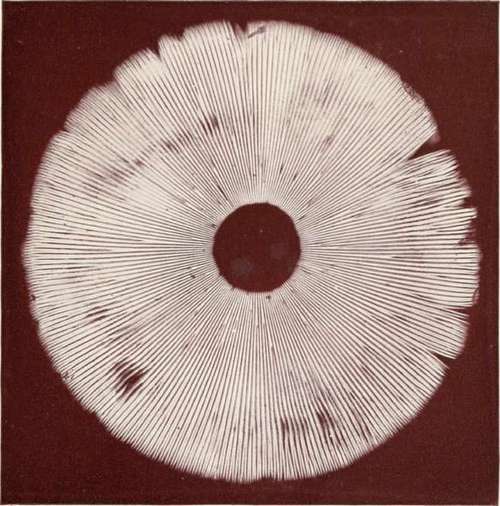 The entire surface of both gills and pores is lined with the spore-bearing membrane or menium, the spores being, produced in fours from each of the crowded sporophores, and, where all air is absolutely excluded, permitting them to fall directly beneath their point of departure as indicated; in the case of the Agaric, in radiating lines in correspondence with the spaces between the gills; and in Polyporus, directly beneath the opening of each pore, whose inner surface is lined with the sporophores, as shown in Plate 36. 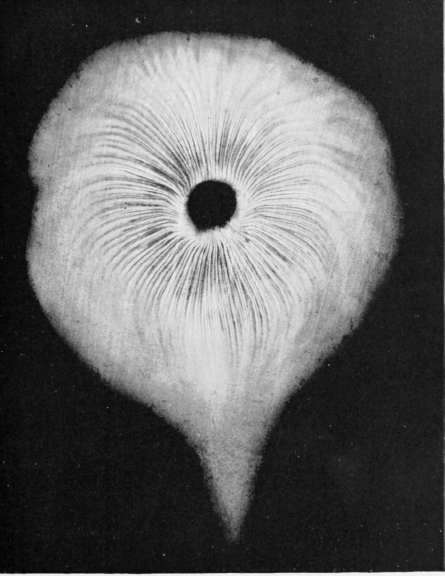 This dust-shower is continuous in nature after the perfect ripening of the spores, but it is almost impossible to conceive of such an entire absence of moving air under natural conditions as to permit even a visible hint of the spore-shower to appear beneath its respective fungus. 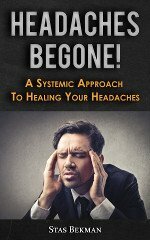 An exception to this rule is sometimes to be seen in fungi of massed growth - as, for example, beneath such a cluster as that shown on page 147. Indeed, a correspondent recently described such a cluster as "enveloped in a mist of its own spores floating away in the apparently still air." 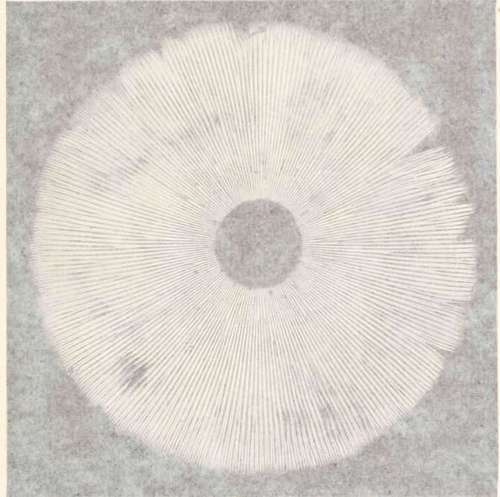 In Plate 38 is shown a spore-print with a peculiar elongated tail. Such was the specimen which I observed when lifting the pasteboard box which had been placed above the mushroom to absolutely exclude the air. The explanation was simple when I discerned that the tapering elongation pointed directly to a tiny hole in the box barely larger than a knitting-needle. Fungus Spores sticky glass slide exposed to the deposit of such dust, and placed beneath the microscope, will reveal many fungus spores. The air is full of them. 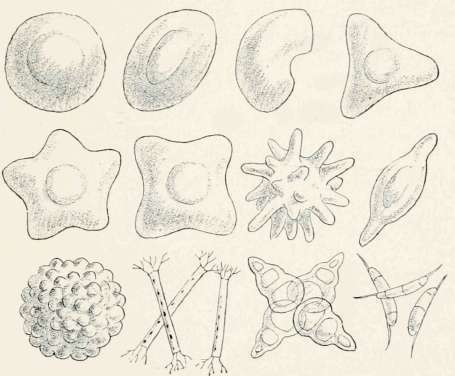 A few of the various characteristic forms of these fungus-spores is shown on a previous page, somewhat as a powerful microscope would reveal them to us. But it is only as they chance to alight individually in congenial conditions for growth that they will consent to vegetate. Thus billions of them are doomed to perish without progeny. These whims of habitat among the fungi are almost past belief. Here, for instance, is a tiny Puff-ball hardly larger than the period on this page. It bursts at the summit, and sheds its puff of microscopic spores, so light as to be without gravity, floating and settling everywhere upon the earth, but only as they chance to alight upon the spines of a dead chestnut-burr of two years' decay will they find heart to grow. Such is the fastidiousness of the little white mushroom, whose globular caps dot the spines of the decaying chestnut-burrs in so many damp nooks in the woods. In closing my chapter a glance at the further eccentricities of choice will not be inopportune. I append a few taken at random from the pages of Berkeley, which lie open before me. In addition to the general broad distinctions of habitat as "woods," "rotten wood," "old pastures," "dunghills," we find such fastidious selections as the following, each by a distinct species with its own individual whim: "Dead fir-cones, sawdust, beechnuts, plaster walls, old fermenting coffee-grounds, wheat ears, cinders, dead oak leaves, old linen, wheat bread, hoofs, feathers, decayed rope, fat, microscopic lenses, and damp carpets."